In elegant families, the omissions in communication are often of more consequence than the information shared. Diana Altman’s “We Never Told” is a fascinatingly intimate look into a outwardly glamorous, inwardly fractured family, whose bonds are undermined by decades of secrecy. The adults, stultified by social conventions into face-saving deceits and vagaries, are laid bare in the X-ray eyes of her sensible, precocious narrator. Ms. Altman has an astonishing memory, and an uncanny ability to recall logic and emotion through chronological time; her narrator glides from being an inquisitive child into an equally curious adult in a way that unearths past mindsets for the reader. Ms. Altman’s prose is wise, comforting, absorbing, and generous. 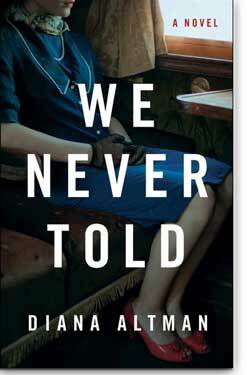 “We Never Told” is a deeply interesting, quietly stunning novel. The story opens with a discussion between sisters Sonya and Joan after their mother's death. They're going through her papers and find information about the baby she gave away when they were teenagers. This is the crux of the title, the secret they never told. It isn't until the very end of the book that this situation comes back full circle and is hardly the main thrust of the story as related. Usually, I'd be annoyed that such a big thing was strung out so very long but in the reading of this book, I found I didn't mind. It was so engaging a read that I often had to remind myself about the big revelation at the beginning. Going back and being told through Sonya's eyes about the life she and her sister lived with and usually without their mother, Violet, was a very engaging story. I enjoyed the contrast between the Adlers and the Greenhouses and what both sides of the family brought to Sonya and Joan's sensibilities as they grew into adulthood. The writing is bright and engaging and it winds up that it's all the little things that add up to make it a well done whole. Sonya as the narrator was funny, infuriating, insightful, selfish and sympathetic. She was all around well done. I can't give spoilers but I did find that the parts that showed Sonya & Joan's relationship with their father and what it was like to have a father so much your mother's senior (even though my parents marriage didn't break up in divorce) and having him die when you're just into your twenties, was personally relevant to me and felt very true. I'd read another by Diana Altman. This reminded me of The Swans of Fifth Avenue because while it's not historical fiction, it feels like it is to me as it begins and spans a part of the last century that is in my mother's memory and experience, not my own. I'm going with this being contemporary fiction as it ends in the present day (Siri is asked to do something on the last page), however. Oh, the genre conundrums!